Proform ZT6 Treadmill Review- Detailed! 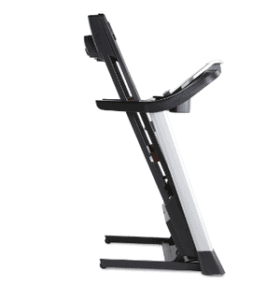 I have decided to review all the Proform ZT series and this is Proform ZT6 Treadmill Review. I have already done a review on Proform ZT8 you may look it up if you wish. One thing I have come to realize with the Proform ZT series is that with each additional model there is a slight upgrade compared to the last. The upgrade could be that the motor, console or the tread belt has been upgraded and so because of this change, the price will be a little pricier than the former model. However, we shall look at the Proform ZT6 Treadmill as it is our custom to review comprehensively so that our readers can finally decide if it good for them or not. The Proform ZT6 is without a doubt one of the affordable units of Proform equipment. Joggers and runners alike can have this unit and still get the best of a workout from it. Just like the ZT8, this unit can be folded thereby solving the issue of space and accommodation, right? Because after workouts you can fold and put it away, even under your bed or lean it on the wall. It has a deck size of about 20’’width and 55’’ Length, unlike the ZT8 that has 60’’ length deck track. How about the motor? The motor is powered by 2.5 Mach Z commercial motor that is considered the most rugged motor that can handle and withstand any amount of workout without experiencing any breakdown. It has got a backlit display the size of 5’’, 18 workout apps and has 10 MPH speed. 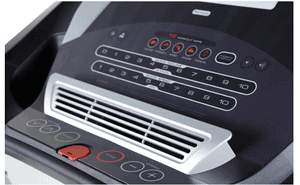 It has this 10% quick incline control, workout fan (CoolAire fan), and music compactable port for iPod. Anyways, let me not bore you with this disjointed features and pros of the Proform ZT6 Treadmill instead let me make the list below. These are an overview of the features and pros of the Proform ZT6 Treadmill, but let’s dive a little bit into explaining some of the things that are lovable about it. Storage– This can be a smart choice for those that really don’t have enough space to store bulky thing because its ability to fold can allow you to store anywhere even on a wall. Preset workout apps– These features make it a lot easier for you to kick start your goal of achieving fitness because there are 18 preset workouts designed by a certified personal trainer to ensure you ensure that you get all the best. In fact, there are 4 categories of programs in this preset workout app which are, Calories, speed, incline, and intensity. Music– They also made it possible for you to listen to music while exercising with the help of an iPod port that will enable you to plug your iPod and listen to an endless stream of music while you hit the track. Cushioning– This is probably one of the most important of the features because most people complain of stress on their joints, feet, and knees. And this cushioning system that consists of the shock absorbers is making sure you don’t experience that. In other words, you can workout longer, burn tons of calories and achieve your fitness goals a lot more sooner than it would ordinarily take. Grip Heart Rate Monitor– The heart rate sensors on the handlebars of this unit will help to display readings even though some argued that it is not hospital-accurate but at least it will be a useful guide. The downside of this unit is that it does not have a chest strap heart rate monitor without which you cannot walk, jog or run without holding the handlebars at all times so as to get your heart rate reading. And this limits or reduces the intensity of your workouts which ultimately will affect how quick you will get a result or achieve your goal. The motor capacity could have been better, but you get what you pay for, right? The quality and the features are right for the price and you can get that from Amazon at a discounted price. However, if you are looking for something better than the Proform ZT6 Treadmill Review I would suggest you up the Proform Pro 2000 Treadmill, this has got awesome features you can’t just refuse but the price is on the high side though. That is why I earlier said, you get what you pay for, the less you pay the less the features, but the more you pay the more and better the features get. Please feel free to drop a comment on the comment box below. How much does this one weigh? I’m wanting to get a treadmill for Christmas but it would have to be maneuvering through the house down the stairs. And if it’s too awkward and heavy to move I rather look at something that is. What would you recommend? Thanks. Hello Sarah, thank you for the visit. The proform ZT6 Treadmill weight was not specified in the product description, however, a typical treadmill weighs anywhere from 175 to 250 pounds depending on the size, though. However, this one has transportation wheels and can be folded for easy movement and storage. I think the maneuvering would not be an issue with the newer treadmills because they become portable when folded the transportation wheels aid in transportation. Exercise is so very important but with the amount of time I don’t have in a day it is also a challenge to take time for it. When I have a treadmill like a Proform available it does make it easier for me because I can see the progress by watching the different digital charts and such. Thank you for this review about Proform treadmills. It is high quality and reminds me that I need to get my workout in for today. Thank you, Guy, and I am glad the review just reminded you of your workout for the day, lol. Awesome review Nnamdi! I am one of those taller individuals you mention so I’m happy you included that in your review. I live in the New England area and winter times can be tough so I am definitely in need of a treadmill when I can’t make it to the gym. Hello Raph, thank you for making it to my website. Sure, you will need one in winter because of cold and poor visibility. Wow, this looks like an awesome treadmill to try, I am looking for a treadmill in the market currently as well. However, do you have a cheaper alternative to recommend? Thank you, Will, yes there is one you might like to own, Sunny Health and Fitness Treadmill, look it up is affordable. Thanks for sharing opportunities to exercise. I did went to the gym for a while in earlier ages but have stopped now. I almost never used the treadmill though because I thought it was boring to stand there and run or walk. I didn’t know that you could get aches in your body using the treadmill, though. That was new to me. Do you use a treadmill yourself and are you enjoying the exercise? Great to know how other experience it. Thank you Tove, no I don’t use treadmills I like the old traditional way of doing cardio, however, this is because it is convenient for me. I think proform zt6 is old version and its not available on market. its update version zt8 is good. it size,workout programme, design and price range is good. So I like the model.